Today internet has managed to become part of our daily routine whether it is accessed from home, work, internet cafes, or through any other means. With the internet becoming an important source of information, research, news, politics, entertainment, job search etc, it has revolutionized our daily lives. Many a times, we tend to look for jobs on some websites, education on other sites, entertainment on others, and the list goes on and on. Unfortunately, there is not a single website that fulfills all of our needs, since the routine social networking websites are not designated for that purpose. Also, you have to keep a complete list of usernames and passwords in order to access each of the previously mentioned services from various websites : Why the hassle? Well, all of this is provided at your fingertips from one single place and that is indeed, Amalana. 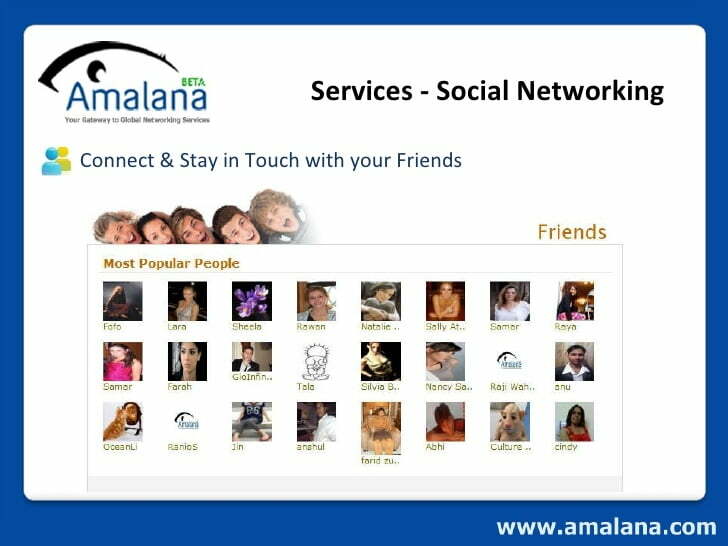 Amalana is a free global networking services one-stop shop. This site was launched in order to provide users with an unprecedented global networking services experience. You can stay connected with your family, friends, and loved ones. Amalana also brings along unique services to further expand your horizons : entertainment services, competitions, beauty services, dating services, and much more. Users can create their groups and can communicate with each other. In groups user can create their own forum topic and also comments on other users forum topic. This is an excellent way of communication in group. The heart and soul of social networking sites are user&rsquo;s personal profiles. It’s like their own Internet sanctuary, a place where they can express their thoughts and feelings, post photographs and show off their network of friends. The Internet can be a dangerous place to post personal information. Here user can set their profile and content to private in some way or another. Additionally they have the ability to block users. A good social network goes above and beyond just allowing users to post profiles and update pictures. Additional features include music sections, video uploads, groups, events, networks, and more. This feature is developed in a manner so students, staff and parents can communicate with each other. Users can share important files and can also request for resources. Legitimate dating service with the option of flirt message, match finder and updates. Amalana has a job section which allows the jobseekers to put their job profile. Jobseeker can also search their interested jobs and also apply to that jobs free of cost. While employers can put their jobs and search resumes from Amalana’s jobseekers database. User can take part into plenty of competitions and also vote on other users entries. A user with highest vote will be announced as the winner and will get a gift decided by Amalana. Amalana provides Daily tips and beauty related news. Also users can share their ideas about beauty using Forum provide in this section. Search is heart of site to find friends, photos, music, videos, forums, web, jobs and more. It’s not just a keyword search but have advance search feature which provides more accurate results. No one wants to be inundated with unsolicited spam friend requests. The best social network sites keep profiles and search options private enough that the only people that can find you are the ones actually looking for users in their own school or neighborhood networks. Even with a completely public profile, users shouldn’t be bothered with more than a couple of unsolicited comments or messages. Amalana is Your Gateway to Global Networking Services.